We are very excited to announce the immediate availability of Matomo (Piwik) v1.12! Matomo (Piwik) v1.12 is a major new release with four big new features, seven smaller new features, several API improvements and all together 82 tickets fixed. This is also the last major 1.X release, which means after this release we will be working on releasing Matomo 2.0. This also means that you should upgrade to PHP 5.3 or higher if you haven’t already, since Matomo 2.0 will only support PHP 5.3 and above. Finally, this release contains two breaking changes to the API. If you use the Matomo (Piwik) API click here or scroll down to see if you’re affected. For those of you who want to help test Matomo (Piwik) 2.0-beta releases as soon as they come up, we’ve made it easier to use our beta releases. Navigate to the Settings > General Settings page and click the The latest beta release radio button. You will then be able to upgrade to beta releases. This isn’t truly a major feature, but we think it’s just as important because it will allow us to create more beta releases and thus catch more bugs before we make a final release. This means more releases and more stability for you. The Segment Editor is a long-awaited new feature that allows you to view, save and edit your segments. Matomo (Piwik) has supported segmentation (filtering visits and reports by arbitrary criteria, like browser family) for quite some time now, but it has never been possible to visually create and modify them. Nor could they be saved for later recall. visually segment your visitors, instead of creating URLs. save segments and easily switch between them, instead of remembering URLs. get suggestions for segments that might be helpful to view. learn more in the Segmentating Analytics reports user documentation..
You can now see how long it took your webserver to generate and send pages over HTTP through the new Avg. Generation Time metric. You can use this new information to benchmark your webapp and web server. The new plugin also enhances Operating system detections (detecting sub versions of Linux, Windows, and more). Note: This plugin is not enabled by default, but will be in Matomo (Piwik) 2.0. If you want to view these reports now, you can activate the plugin in the Installed Plugins admin page. Navigate to Visitors > Devices to see the new reports. You may also use the new (beta) ‘Device type’. 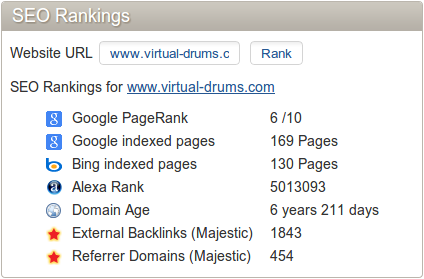 We’ve added two new SEO metrics to the SEO widget, both of which are calculated by MajesticSEO.com. These metrics will tell you the number of external backlinks (the number of links to your site from other sites) and the number of referrer domains (the number of domains that link to your site). We thank the team at Majestic for their support and hard work in bringing you these metrics to your Matomo (Piwik) dashboards! There is now a simple new widget you can use to see the number of visitors, visits and actions that occurred in the last couple minutes. We call it the Real Time Visitor Counter! There is now a new segment parameter you can use to segment your visits: siteSearchKeyword. This parameter will let you select visits that had site searches with a specific keyword. Ignore URL letter case when importing log files. We’ve added a new option to the log import script, –force-lowercase-path. When used, the importer will change URL paths to lowercase before tracking them. This way http://domain.com/MY/BLOG will be treated the same as http://domain.com/my/blog. We’ve also modified the Providers report so prettier and more up-to-date names of ISPs are displayed. Customize the background/text/axis color of graphs. Send your users to a custom URL after they logout. If you manage a Matomo (Piwik) installation with many users and you want to send them to a custom page or website after they log out of Matomo, you can now specify the URL to redirect users after they log out. BREAKING CHANGE – renamed segment parameters. If you use one of the old segment parameter names, Matomo (Piwik) will throw an exception, so you should notice when you’re using an old name. BREAKING CHANGE – changes to the input & output of the Live.getLastVisitsDetails method. The method no longer uses the maxIdVisit query parameter. It has been replaced by the filter_offset parameter. Site search keywords are now displayed in a <siteSearchKeyword> element. They were formerly in <pageTitle> elements. Custom variables with page scope now have ‘Page’ in their element names when displayed. For example, <customVariablePageName1>, <customVariablePageName2>, etc. Filter results of MultiSites.getAll by website name. It is now possible to filter the results of MultiSites.getAll by website name. To do this, set the pattern query parameter to the desired regex pattern. Get suggested values to use for a segment parameter. The new API method API.getSuggestedValuesForSegment can now be used to get suggested values for a segment parameter. This method will return a list of the most seen values (in the last 60 days) for a certain segment parameter. So for browserCode, this would return the codes for the browsers most visitors used in the last 60 days. Use extra tracking query parameters with the JS tracker (such as ‘lat’ & ‘long’). As we said above, Matomo (Piwik) v1.12 is the last in the 1.X series of releases. This means we are now officially working on Matomo 2.0. Matomo (Piwik) 2.0 will be a big release, to be sure, but it’s going to bring you more than just a couple new features and a bag of bug fixes. For Matomo 2.0 we will be revisiting the user needs and the ideals that originally prompted us to create Matomo in order to build our vision of the future of web analytics. Matomo (Piwik) 2.0 won’t just be a bigger, better web app, but a new platform for observing and analyzing the things that matter to you. If you have some free time and if you want to contribute to one of the most awesome open source projects around, please get in touch with the Matomo (Piwik) team, or read this page to learn more? For the full list of changes in Matomo (Piwik) 1.12 check out the Changelog. Thank you to the core developers, all the beta testers and users, our official supporters, the translators & everyone who reported bugs or feature requests. Also thank you to softwares we use, and the libraries we use. If you are a company and would like to help an important project like Matomo (Piwik) grow, please get in touch, it means a lot to us. You can also participate in the project ?